Today is the Solemnity of the Sacred Heart of Jesus. At Mass today, the Alleluia verse refers to Matthew 11:29 - "Learn from me; for I am gentle and lowly in heart, and you will find rest for your souls." I was struck by this particular line, and so I did a text search for the word "heart" in the New Testament, and sure enough, this is the only place in the Gospels where Jesus refers to his heart. When we think of the Sacred Heart, we think of it pierced and bleeding, and maybe we think of the triumph of the Sacred Heart over sin and death. How often do we think of the Sacred Heart as "gentle and lowly?" Every victory that Christ won for us, He won through his meekness. By subjecting Himself to be as a "slave," He gained his exaltation. Correct each other we must, rage against sin and evil we must and hate the devil we certainly must. While we do these things, however, we are also called to imitate Christ in his meekness. This is one of our greatest challenges as Christians. In addition, this is a special feast day for my family, as we are consecrated to the Sacred Heart. It is a beautiful devotion, about which you may read more here. I also found two links (1 and 2)with enthronement rituals similar to what we used. Our consecration is renewed daily with this prayer, which we recite at dinner after the usual Catholic prayer before meals. 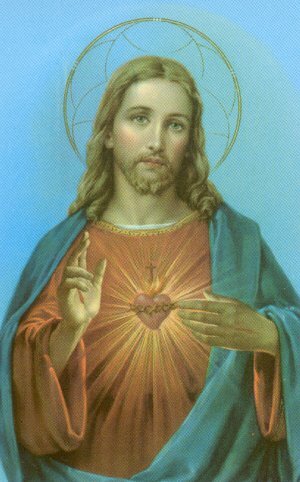 Dear Sacred Heart of Jesus, we renew our pledge of love and loyalty to You. 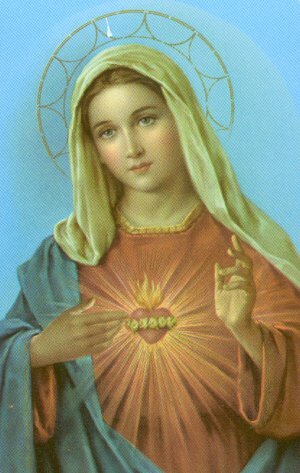 Keep us always close to Your loving Heart and to the most pure Heart of Your mother, Mary. May we love one another more and more each day, forgiving each other's faults as You forgive our sins. Teach us how to see You in those we meet outside our home. Please help us keep our love for You always strong by frequent Mass and Communion. Thank You, dear Jesus, King and Friend of our family, for all the blessings of this day. Protect us during this night. Help us all to get to Heaven. Amen. This page is a archive of entries in the Feasts category from June 2005. Feasts: December 2007 is the next archive.